The land of Hyrule is in chaos. As Link you'll be sent on a treacherous journey to return six precious Crystals to their origins in six stone statues. Only by defeating the guardians of the six palaces will you gain passage to the seventh Palace, take on the ultimate challenge that awaits you and wake the Princess Zelda from her sleeping spell. On your way, helpful villagers you encounter will offer clues and secret messages invaluable in your quest. As you guide Link through the levels of Hyrule, close-ups and overviews will enhance your video vision. Are you up to the challenge? 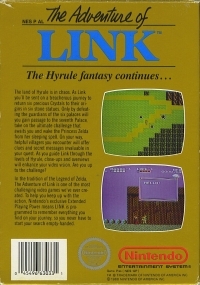 In the tradition of the Legend of Zelda, The Adventure of Link is one of the most challenging video games we've ever created. To help you keep up with the action, Nintendo's exclusive Extended Playing Power means Link is programmed to remember everything you find on your journey so you never have to start your search empty-handed. 02-08-2014 pacpix Box Text The Hyrule fantasy continues... The land of Hyrule is in chaos. As Link you'll be sent on a treacherous journey to return six precious Crystals to their origins in six stone statues. Only by defeating the guardians of the six palaces will you gain passage to the seventh Palace, take on the ultimate challenge that awaits you and wake the Princess Zelda from her sleeping spell. On your way, helpful villagers you encounter will offer clues and secret messages invaluable in your quest. As you guide Link through the levels of Hyrule, close-ups and overviews will enhance your video vision. Are you up to the challenge? 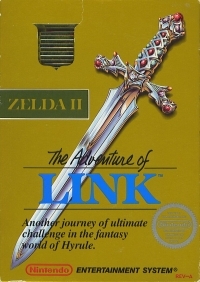 In the tradition of the Legend of Zelda, The Adventure of Link is one of the most challenging video games we've ever created. To help you keep up with the action, Nintendo's exclusive Extended Playing Power means Link is programmed to remember everything you find on your journey so you never have to start your search empty-handed. 08-12-2011 atariboy Box Text There are six palaces hidden in Hyrule. Link must gain experience by fighting Ganon's underlings, and get information while visiting towns here and there. And, after defeating the guardians at the palaces of Death Valley, he must obtain the Triforce of Courage -- That is Link's mission. 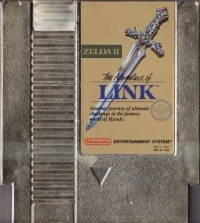 This is a list of VGCollect users who have Zelda II: The Adventure of Link in their Collection.